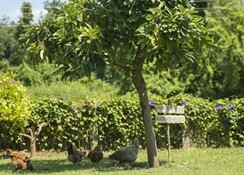 Situated in a garden with organically grown fruit trees, this small beachfront hotel features a restaurant bordering the sandy beach and home-cooked meals. Fethiye is a 10-minute drive away. 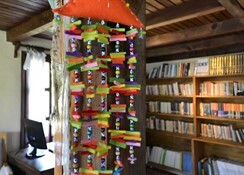 Guests at Yonca Lodge can stay in rurally located rooms that are decorated with natural materials like wood and stone. 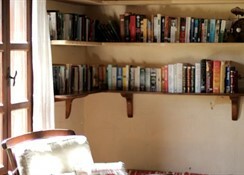 Each room features free Wi-Fi, air conditioning and a kettle to prepare tea. 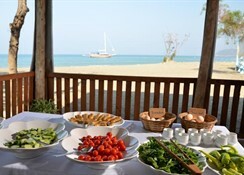 Yonca’s open restaurant uses organic ingredients and is situated next to a small creek. Its beach-side terrace offers stunning views of the Mediterranean Sea and has an adjoining bar that serves cooled drinks on the hotel''s beach benches. 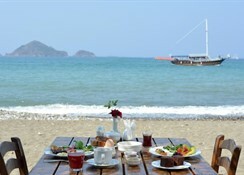 The Yonca’s reception staff can arrange car and bike rentals, as well as airport shuttles to Dalaman Airport, 40 km away. They can also advice you on nearby activities, including paragliding, diving and horseback riding. With free parking, this pastoral hotel is situated a 20-minute drive from the marina resort of Göcek. Local buses to Fethiye run every 15 minutes and are located just down the road. This eco-friendly hotel is situated in a beautiful location overlooking the sea and next to a river. The small village of Yaniklar is 3 km away, Calis with its bars and pubs 10 km. 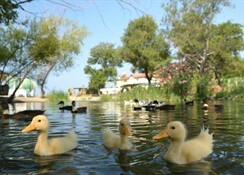 The popular resort of Fethiye can be easily reached by public transport. Dalaman Airport is approximately 40 km away. The hotel features 24-hour reception, currency exchange, free WIFI throughout, restaurant, bar, playground, bicycle rental, car hire, airport shuttle, laundry service and luggage storage.